Three repurposed shipping containers will become home for a family on the Bearspaw First Nation in September. It’s a pilot project that Rob Shotclose, CEO for Bearspaw First Nation, hopes will prove to be at least part of the answer for the unique living conditions faced on First Nations. Large family sizes; families that consist of disabled persons and Elders; general wear and tear; mould growth; fire concerns; and, lack of band or family funding to maintain homes; are quite often the norm. Three repurposed shipping containers will become home for a family on the Bearspaw First Nation in September. It’s a pilot project that Rob Shotclose, CEO for Bearspaw First Nation, hopes will prove to be at least part of the answer for the unique living conditions faced on First Nations. Large family sizes; families that consist of disabled persons and Elders; general wear and tear; mould growth; fire concerns; and, lack of band or family funding to maintain homes; are quite often the norm. “We’re still going to need funding, but I think this will help a lot with longevity, avoiding a lot of maintenance costs on a year to year basis. I think it’s a good product,” said Shotclose. 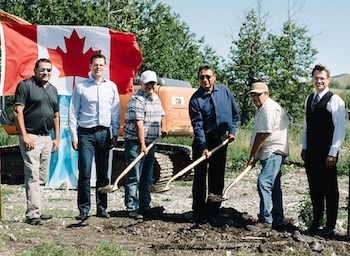 The pilot project is a partnership between developers Ladacor Advanced Modular Systems, Alberta Innovates Technology Futures, and the Bearspaw First Nation. The repurposed container home is the first single family dwelling built by Ladacor, says Shotclose, who explains the project came about when Ladacor approached the Stoney Nakoda Resort and Casino in early 2015 to talk about using containers for employee housing. Ladacor has done multi-unit dwellings before and housing has been an issue in recruiting and retaining employees in the immediate location of the casino. Instead, Bearspaw First Nation opened talks with Ladacor about individual family homes. This home will be located in Eden Valley, placed on a basement. The family lost their home previously to fire and insurance is helping to pay for the new house along with funding from AITF. The 1,260-square foot home will contain four bedrooms upstairs and two bedrooms downstairs. The plan is to place a second storage container home in Morley next year. Shotclose says it has not yet been decided how the family to receive that unit will be chosen. Shotclose says that with Indigenous and Northern Affairs Canada setting aside $400 million for First Nations housing over the next two years, Bearspaw is hoping to access that funding for more shipping container homes, this time multi-family units.